Anthony and Cleopatra are being celebrated in Rome, Italy with exhibitions until February 2014 because this year is the 2,000th anniversary of Emperor Augustus’ death in A.D. 14. 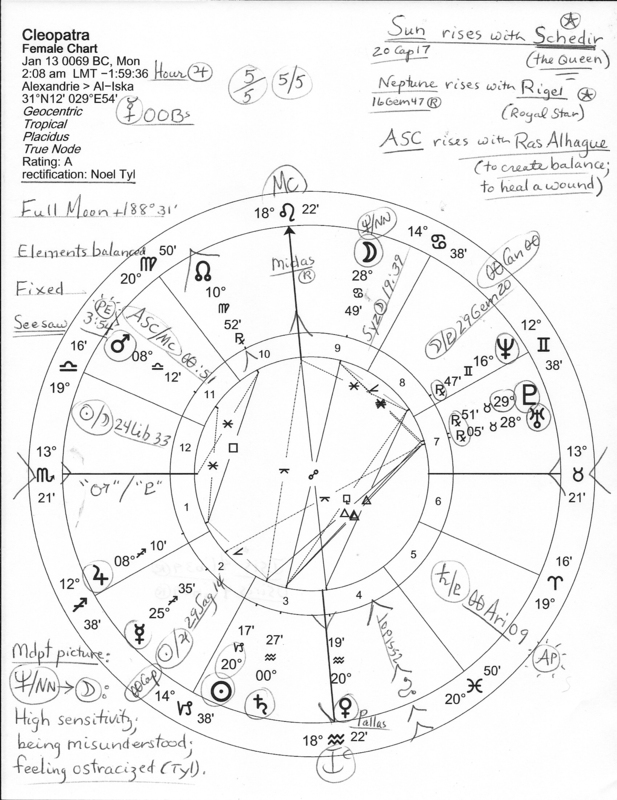 Her chart has been rectified by master astrologer and author, Noel Tyl and if you can enlarge the image, you’ll find a few basic notes penned thereupon by yours truly. Example: Cleopatra’s Sun arose with fixed star Schedir, the queen and her Neptune Rx in Gemini arose with Rigel, one of the four Royal Stars of Persia (‘to bring knowledge’); her Ascendant @13Sco21 arose with Ras Alhague (‘to create balance; to heal a wound’). Historical records show she was born on January 13, 69 B.C. in Alexandria. The Queen of Egypt was the last of the Egyptian pharoahs. As you see in her chart, the Elements and Hemispheres are balanced though there is an emphasis on Fixed signs showing rigidity and firm determination. In the 7th house of Alliances/Partnerships, you see Uranus @28Tau05 Rx conjunct Pluto @29Tau51 Rx (a critical 29th degree) which imprints upon her birth the Great Conjunction of Uranus and Pluto, exact on August 26, 70 B.C. @1Gem46. This was the last of their conjunctions prior to the more familiar one that occurred in mid-Virgo in the mid-1960s–actually of influence from 1963 to 1968. If you were born with Uranus-Pluto conjoined in your chart, you are very aware of environmental degradation and wish to create or restore balance and healing and bring order to chaos–and on some level or levels, you share such wishes with Cleopatra, Queen of the Nile! The Queen’s Sun Cap-Moon Can personality blend supported her sensitivity (Neptune-NN = Moon–see chart, bottom left) yet added strength and toughness when needed via Saturn’s rule of Capricorn, the sign of government, law, and business. Extremely observant and witty, she was known for her facility with languages (communicator Mercury out-of-bounds in Sagittarius, ruled by expansive Jupiter.) This is the father-mother (Saturn-Moon) combination which, if well directed, assures success since it combines the positive qualities of each archetype. Among others, the Sun Cap-Moon Can personality blend is shared natally by: Sir Isaac Newton, Mary Tyler Moore, Pablo Casals, and interestingly, by Jean Francois Champollian, known as the Father of Egyptology!